We are very pleased to announce the installation of our new digital press room, this is a major upgrade and delivers you market leading digital print quality. Our ageing Ricoh 901 was starting to creak under the pressure of our growing digital print service, so the time had come to investigate the next step for us. 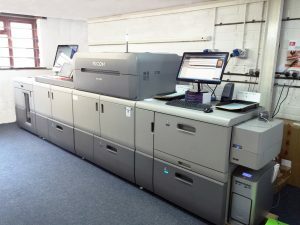 After extensive testing the decision was taken to invest in two new presses, the Ricoh pro9100 Colour Production Press and a Ricoh 8110 Mono Production press. This grows our department considerably and brings you an exciting range of new services not generally available in commercial print, all on a short run basis so you can enjoy from as little as 50 copies…. This overcomes all the limitations of digital print and further adds to our ‘Print Unlimited’ ethos started by our Lightcure Litho print process. This couple with our investment in new FOGRA Standard proofing means all of our print, Litho, Digital & Proofing are all calibrated to FOGRA standard, colour never looked so good!